In 2018, the Supreme Court will hear a challenge to a California law requiring crisis pregnancy centers (CPCs) -- anti-abortion organizations that erroneously represent themselves as comprehensive reproductive care clinics -- to inform patients about their eligibility for low-cost reproductive health services, including abortion. If previous abortion-related cases are any indication, before the Supreme Court even hears oral arguments, media will be inundated with attempts by abortion opponents to downplay CPCs’ deceptive tactics and instead promote CPCs as harmless institutions simply trying to protect their freedom of speech. On November 13, the Supreme Court agreed  to hear National Institute of Family and Life Advocates v. Becerra, a case that involves  a California statute called the Reproductive Freedom, Accountability, Comprehensive Care and Transparency (FACT) Act. Under California’s FACT Act, licensed CPCs are required to display a notice at their facility and in their advertising materials that states  that California provides “immediate free or low-cost” reproductive services, which includes abortion. Unlicensed CPCs are required to post a notice that they are not a medical facility and do not have a medical professional doing on-site supervision. The National Institute of Family and Life Advocates (NIFLA) -- which represents  both licensed and unlicensed CPCs in California -- challenged the law as a violation of their CPCs' free speech rights to not promote abortion or contraceptives. The lower courts ruled  in favor of upholding the state law, and the case is now before the Supreme Court. CPCs are deceptive organizations that often rely on fearmongering, deceptive advertising, and medical misinformation to scare or persuade individuals into continuing pregnancies. As proceedings around NIFLA v. Becerra ramp up in 2018, here are some of the harmful tactics and impacts of CPCs that media should not ignore. CPCs often position themselves as providing a full set of comprehensive  reproductive health care  services. For example, The Weekly Standard wrote  that CPCs have such services as “pregnancy testing, ultrasounds, and testing for sexually transmitted infections,” “onsite prenatal programs,” and “material assistance” for low-income individuals. Similarly, abortion opponents  often advocate  that Planned Parenthood and other reproductive health clinics are unnecessary because some CPCs provide  identical or even better care for less money . However, many of the over 4,000 CPCs in the United States have no licensed medical personnel and provide no referrals for birth control or abortion care. What is worse, they fail to disclose this to women who are seeking accurate and timely health information. Once women are in the door, CPCs then give misleading and false information about birth control, emergency contraception, and abortion care in order to stop women from using or obtaining these critical health care services. This undermines women’s ability to make informed decisions about their pregnancies. The inadequate care provided by CPCs exacerbates the lack of access to health services experienced by already vulnerable communities. This problem is compounded by the fact that some CPCs receive federal  and state  funding through both direct or indirect avenues, depriving programs dedicated to facilitating actual health care access of resources. As Reproaction’s Erin Matson and Pamela Merritt explained , “Not only do the individuals seeking information and services from crisis pregnancy centers suffer, communities as a whole pay the price.” As but one example, the authors pointed to Missouri where “funds from Temporary Assistance for Needy Families (TANF) are diverted to go toward the Alternatives to Abortion Program,” which allocates  funding to CPCs. As they described, although Missouri “has the second-highest number of food-insecure residents in the country,” funds for TANF are instead diverted to the deceptive work of CPCs to the tune of $2 million in 2016 and at least $4.3 million in 2017. Missouri is not alone: When Vice President Mike Pence was governor of Indiana, he signed  a contract giving part of the funding for TANF to the state’s Real Alternatives CPC program. Perhaps the most illustrative example of how CPCs can take millions in state funding without providing any comprehensive reproductive services for low-income people can be seen in the failure of The Heidi Group in Texas. In 2016, Texas awarded  a $1.6 million contract to The Heidi Group -- an anti-abortion organization run by serial misinformer Carol Everett  -- for the purpose of providing low-cost reproductive health care. As Rewire reported , “The Heidi Group had never before provided health care services,” and had “focused predominantly on supporting anti-choice crisis pregnancy centers.” Unsurprisingly, despite promising to improve health care access, The Heidi Group directed  the funding to CPCs, which were unable or unwilling to rise to the challenge. In 2017, the Associated Press reported  that the efforts of The Heidi Group were “quietly sputtering” and that the organization had “little to show for its work.” As the Dallas Morning News stated , the group had “no fresh initiative of social media outreach, no overhaul of outdated clinic websites, no public service announcements, no 1-800 hotline to help low-income women find affordable services in their communities.” As a result , in August 2017, Texas took back  some of the money awarded to The Heidi Group. Beyond CPCs’ inconsistent support for low-income patients, some of these centers go out of their way to target communities of color. In a 2013 report, NWLC identified  that some national associations of CPCs emphasize outreach to black communities because “of the high rates of abortion in certain communities” -- a statistic that gets used  by abortion opponents  to suggest  that abortion providers are engaged in so-called “black genocide .” As NWLC explained, high rates of abortion are due to high rates of unintended pregnancy which “reflect widespread disparities in health outcomes and access to health care which are in turn influenced by social factors such as income, education, employment and earnings, and neighborhoods” -- inequalities not addressed by CPCs. 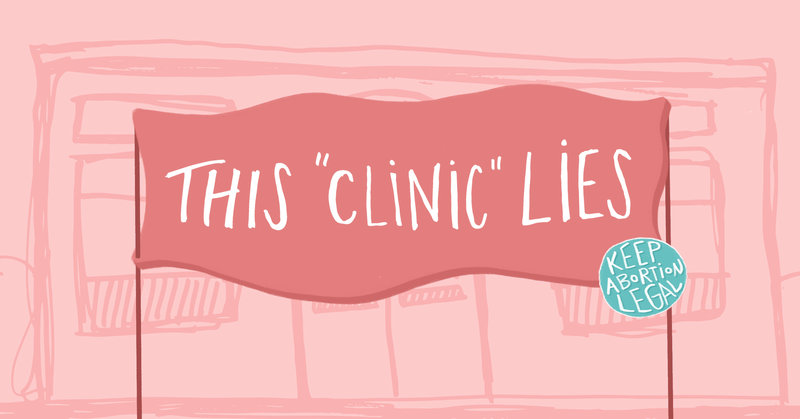 CPCs begin their deception before people ever step into their clinics, using deceptive advertising to imitate abortion clinics. AWHC hosts a website, the home page of which includes tabs for “Abortion Pill” and “Surgical Abortion.” The site even lists costs for these services. Hidden in a different portion of the site is a disclaimer noting AWHC does not “offer, recommend, or refer for abortions or abortifacients.” In addition, the website is riddled with exaggerations and inaccuracies regarding abortion, listing psychological risks associated with abortion and advertising an abortion reversal option, all of which has been debunked by medical experts. As Rewire noted before the complaint was filed, AWHC’s website also contained “a near-verbatim repetition of the stated mission of the abortion clinic nearby: ‘to empower women to make informed decisions that support their privacy, dignity and self-respect.’” Later, AWHC deleted  this passage and other misleading claims from its website. AWHC’s advertising and imitation tactics are, unfortunately, not an anomaly. In another striking example, the anti-abortion organization Human Coalition (which both supports and runs CPCs) centered  its mission on using “internet search engine marketing” to target what it calls “abortion-determined” people in order to redirect them from abortion clinics to one of its CPCs. Human Coalition places ads on Google using “keywords” that people seeking abortions might use to locate a clinic, even though Human Coalition does not provide  and will not refer anyone for an abortion. Those ads direct people to landing pages that have Human Coalition’s call center number, where Human Coalition employees then try to dissuade them from abortion. Although Human Coalition has become particularly adept at this tactic, Broadly detailed  a similar practice  used by Heartbeat International (HBI) -- a national association of CPCs. As Broadly found, in its “2014 annual report, HBI boasted that ‘a woman who makes a Google search such as “pregnant and scared” finds a local Heartbeat International affiliate or Option Line in her search,’” even though Heartbeat International’s CPCs do not perform or refer for abortions. Even if patients do find their way to an actual abortion clinic, some CPCs are still able to reach them with targeted advertising and misinformation. In 2016, it was reported  that advertising firm Copley Advertising was using geofencing to target those on their phones at abortion clinics and send them ads for CPCs. (Geofences are technological "fenced-in" area that advertisers use to ping smartphones with ads when people enter those areas.) As Rewire explained , a national association of CPCs, RealOptions, hired Copley Advertising “to send propaganda directly to a woman’s phone while she is in a clinic waiting room,” a tactic that “presents a serious threat to the privacy and safety of women exercising their right to choose, as well as to abortion providers and their staff.” In April 2017, Massachusetts reached  a settlement with Copley Advertising that prohibited the company from geofencing around clinics, although, according  to Rewire, Copley operates in other states as well, and it is unclear whether it is still using geo-fencing in those states. As I sat there having my life probed, the purpose of the questions dawned on me. In case the test was positive, my “counselor” wanted to know which tactic to use to persuade me to continue the pregnancy — exactly where my resolve was the weakest. Was there a loving Christian boyfriend who would make a great dad? Did I have kind supportive parents who would be excited by the idea of a grandchild? I knew I wasn’t pregnant — knew exactly what she was doing — knew she wasn’t a doctor. But my body reacted instinctively to her questions with guilt and shame. It felt like a kick in the gut when she asked if I had told my brother about the baby, and I felt a creeping sense of selfishness as I imagined the door slamming on my shared apartment, my twenties, my life. Would my parents want me to have this child? Would it matter? Beyond manipulating targeted digital advertisements, CPCs also engage in outreach through both traditional and new media platforms to bolster legitimacy for their claims of being “health care” providers. CPCs also attempt to use “new media” for outreach by creating either their own platforms, outlets, or applications. In one example, Heartbeat International created its own media outlet, Pregnancy Help News , when its reliance on traditional publications proved insufficient for spreading the group’s misinformation. In another instance, California-based CPC chain Obria Medical Clinic created  an app called “Obria Direct.” Obria’s founder Kathleen Eaton Bravo told  Eternal World Television Network’s Pro-Life Weekly, a program created and sponsored by anti-abortion group Susan B. Anthony List, that “abortion today is on the smartphone.” Bravo said she saw Obria as a “brand” that serves as “an alternative to Planned Parenthood.” Since Planned Parenthood already has  an app for its California affiliates called “Planned Parenthood Direct,” Obria’s branding suggests its app is meant to emulate or replace legitimate reproductive care resources. It should be noted  that not every CPC engages in every one of these tactics. But regardless of how a CPC brands itself, one thing remains clear: CPCs do not perform or refer for abortions, and they will try a variety of tactics to deter individuals from obtaining one. Abortion is a personal  choice , and should be treated as an essential option of comprehensive health care . As the Supreme Court debates and decides NIFLA v. Becerra in 2018, the media should call out CPCs when they use deceptive tactics, and resist promoting the inevitable right-wing spin that free speech of such organizations is being unduly impeded.